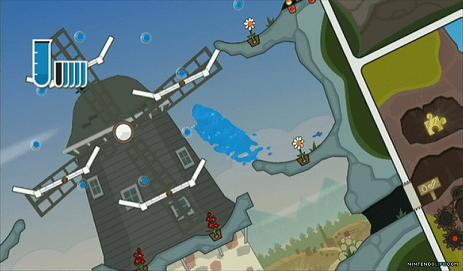 fluidity (aka hydroventure) is generally regarded as one of the highlights of wiiware, but even though i got it a long time ago it’s taken me many attempts to gain enough momentum to actually finish it. although the game is visually appealing, with its storybook conceit and the resulting aesthetic, the controls tend to provoke a “love it or hate it” reaction. much as i tried to tolerate them, it was hard for me to feel anything but varying shades of annoyance with the controls, particularly the often needlessly motion-controlled movements which can be downright obnoxious. the most obvious example is having to pull the remote vertically to jump, which by now i imagine most anyone who has played any number of wii games will agree is one of the worst uses of the wii remote ever. also, while a novel idea, having the main character be a puddle of water ends up being a pain because it’s hard to control. even with the “gather” ability, which you unlock early on, despite your best efforts you’ll find yourself continually accidentally dividing your character and awkwardly trying to reassemble it into a single mass. in some ways the controls are actually worse than those of kirby tilt ‘n tumble and yoshi topsy turvy, b/c at least those games didn’t use the tilt mechanics as the central movement for a side-scrolling type of platformer, as having motion controls requires sacrificing a lot in the way of comfort and precision. The problem wasn’t just that a few of the jumps required in the game’s final goop-clearing boss stage are tough. The problem is that, after each failed attempt, the developers inexplicably force you to replay more than five minutes of complex gameplay before you try it again. And when you lose your four or so lives, you get to re-play at least 20 minutes of gameplay to try again. Infuriating. … It suffers from an archaic flaw — the intensifying of its own difficulty due to forcing the player to re-play significant chunks of levels they can pass easily just to get back to that one tough jump. although the game left a bad taste in my mouth and i felt like the controls were working against me most of the time, i can see why others would enjoy it more than i did. i’m skeptical the sequel, which is available on the 3DS eshop, will leave me much more satisfied since it seems it uses the same mechanics with the added annoyance of having the screen constantly shifting around, but hopefully the overall experience will be a bit more smooth and streamlined.